He was presumably an experienced streetfighter, retaining some fighting skill into middle age (or older). The Colisseum was considered one of the most opulent hotel/casinos on Las Vegas' strip. (Marvel Comics Presents#38/3 (fb) - BTS) - Mickey Berengetti and his business friends got young performer Brian Newman started, securing his record contract and setting him up with all the right people. (Marvel Comics Presents#38/3 (fb) - BTS) <5 years before the main story> - When Brian Johnson's contract/employers forced him to record music he didn't like (and he allegedly made a lot less than Berengetti and his associates), he stopped performing and became reclusive. (Incredible Hulk II#348 (fb) - BTS) - Michael Berengetti encountered the Hulk (in his gray persona and "looking like he'd been through a mixmaster" after a recent conflict), at the Yucca Flats in Nevada. 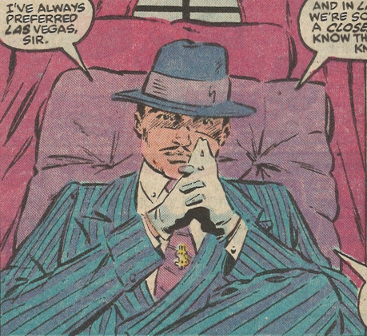 With the Hulk trying to keep his true identity secret and calling himself Mr. Fixit, Berengetti (who realized Fixit's true identity) offered him a deal: He'd give Fixit a life of luxury, and in exchange, Fixit would be his enforcer in Las Vegas, as his Coliseum hotel and casino. Fixit happily agreed, and Berengetti set him up in a fancy penthouse where he had his every want and need attended to. (Incredible Hulk II#348 (fb) - BTS) - Michael often called Fixit "Joe," after Mighty Joe Young, his favorite big gorilla...until Fixit came along. (Incredible Hulk II#348 (fb) - BTS) - Over the next three months, Berengetti earned Fixit's respect by keeping his word; Fixit considered him "the only guy I ever met who gave me a good life and didn't betray me...yet." (Incredible Hulk II#347) - A frustrated patron at the Coliseum casino pulled out a gun after blowing his last dollar on a slot machine. Berengetti came down from his penthouse and told the unhinged patron to leave quietly or else he would summon Mr. Fixit. The patron immediately surrendered peacefully to the police, and Berengetti went back up to his penthouse office. When Berengetti arrived at his office, he was surprised to find a man named Harry waiting for him. Harry introduced himself as a representative of the gangster Anthony Gold, who was looking to expand his operations into Las Vegas, and extended an offer to Berengetti to work with Anthony Gold. Berengetti, scornful of Anthony Gold's operations in the drug trade, rebuffed Mr. Gold's offer. Later, as Berengetti left the casino with his girlfriend, Suzy, Anthony Gold's goons steered Berengetti's car off course and forced him toward the Carleton, a gutted hotel Anthony Gold had bought and in which he was waiting for them. Berengetti activated a homing beacon on his walking stick to alert Mr. Fixit. Once they arrived at the Carleton, Anthony Gold confronted Berengetti for refusing to work with him. When Gold asked him if he rememebered what it was like to be young and hungry, Berengetti noted that his people had style back then and ate punks like Gold for breakfast, punctuating the insult with a punch to Gold's stomach. Gold's men then grabbed Berengetti, allowing Gold to punch him repeatedly; as Berengetti remained defiant, Gold and his men pulled their guns and prepared to finish him off. Moments later, Mr. Fixit arrived and quickly dispatched Anthony Gold and his men. Mr. Fixit spared Gold at Berengetti's instruction. (Incredible Hulk II#348) - Berengetti heard that Mr. Fixit was in a bad mood (due to a resurrgence of Banner's persona and his being pained by sunlight), so he went up to Mr. Fixit's penthouse to check on him. He assured "Joe," that he would never betray him, and asked him to tell him if he had any problems. Meanwhile, Anthony Gold hired the Absorbing Man to destroy the Coliseum. When Berengetti saw the Absorbing Man enter the Coliseum and begin a rampage, he activated Mr. Fixit's pager, and Mr. Fixit's fight with the Absorbing Man took them away from the Coliseum, to the Hoover Dam; Fixit eventually literally demolished the Absorbing Man. (Hulk Family: Green Genes#1) - When the chaos-loving mutants Discordia and Tantrum assaulted the Colosseum (sic), Mr. Berengetii contacted Fixit, told him of the "unauthorized decoration of the high-limit slots," and told Joe, "It's time to earn your keep, m'boy." Only to happy to avoid an encounter with She-Hulk (Jen Walters), who suspected he was the Hulk, Fixit rushed off and took out Tantrum, while She-Hulk took out Discordia. (Marvel Comics Presents#6/4 - BTS) - When crimes at their facilities increased due to criminals avoiding Fixit at the Colisseum, a group of Las Vegas casino owners, including Ralph Taylor, got together and agreed to send an "army" to take down Fixit. Soon after, a group of hitmen assaulted Fixit in his room at the Coliseum, but Fixit pummeled them all and drove them off. (Marvel Comics Presents#6/4) - With Suzy, Mickey met with Fixit, noting his room to be demolished, but assuring him he would get a new one. 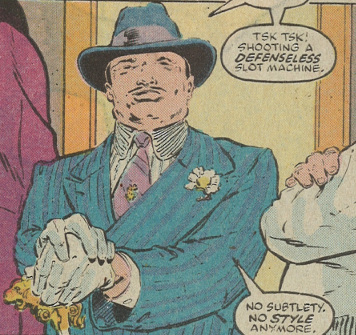 When Fixit announced he planned to cancel his date with Marlo Chandler and go after the men who had destroyed his place, Berengetti convinced him to wait, giving him $5000 to blow on a new suit and showing Marlo a good time out on the town; in fact, Mickey encouraged Fixit to check out the competition, recommending Ralph Taylor's Comet casino as "real nice." (Marvel Comics Presents#6/4 - BTS) - Taylor's men advised him of Fixit's arrival at the roulette wheel, and when Marlo repeatedly lost, Fixit suspected treachery and demolished the table and pressured the house manager to pay him big winnings. With heavy damages both to his place and to his reputation with customer's present during the confrontation with Fixit, Taylor and the other casino owners agreed to leave Berengetti alone from now on. (Incredible Hulk II#351 (fb) - BTS) - During Fixit's prolonged absence (as the Hulk, during the Evolutionary War), Mike swore to Suzy he didn't know where Fixit was. (Incredible Hulk II#354) - Mr. Fixit took Berengetti and Suzy to an out of town hotel to lay low. In the morning, Mr. Fixit turned back into Bruce Banner and left the hotel, leaving Berengetti to assume that Fixit had abandoned him. Berengetti and Suzy got a taxi back to Las Vegas, and arrived to find the Coliseum all but empty of patrons. One of Berengetti's employees explained that the Maggia had threatened the Coliseum's patrons and business contacts, and business was suffering as a result. Later, the Maggia held a meeting at the Royal Grand Casino and Hotel for all the casino heads, where the Maggia announced they would henceforth be taking a cut from everyone's operations. Berengeti arrived at the meeting and told the Maggia that he would not pay. Mr. Fixit arrived moments later to protect Berengetti. The Maggia threatened Mr. Fixit with the "Persuaders," a group of Maggia enforcers with enhanced strength. Mr. Fixit and the Persuaders went onto have a brawl, with the Maggia and casino owners putting bets on the outcome of the fight. Berengetti put up his casino as collateral and covered all bets against Mr. Fixit. As word spread around Las Vegas, gamblers all over the city started placing bets. Mr. Fixit beat all the Persuaders, with Berengetti collecting an enormous payout as a result. (Marvel Comics Presents I#26/4 (fb) - BTS) - Jonas Marlin, the owner of Marlinworld, lost 100,000 dollars at Berengetti's casino and skipped town without paying his debt. Berengetti sent Mr. Fixit to Marlin to collect the debt, which he did. (Marvel Comics Presents#38/3 (fb) - BTS) - Mickey sent Fixit to collect a delinquent debt of $109,000 from Bone Marrow ceo Mr. Gruska; as added interest, Mickey wanted Gruska to arrange a concert with singer Brian Newman (whom Gruska had managed, and whom was Suzy's favorite singer) at the Colisseum's main room. 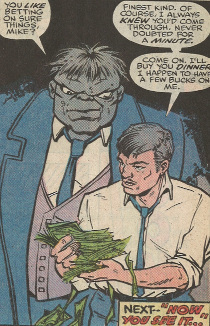 (Marvel Comics Presents#38/3 - BTS) - Fixit confronted Gruska and fained a check for the debt. However, Gruska informed him that Newman had become a recluse and had not performed in 5 years. Fixit warned Gruska not to disappoint his employer or he would be sorry. (Marvel Comics Presents#38/3) - Soon after, however, Mickey informed Fixit that Gruska had taken off for Europe, and that Newman could not be reached. Frustrated with "the ungrateful runt," Mickey noted he would appreciate it if Fixit would talk to Brian. (Marvel Comics Presents#38/3 - BTS) - Newman refused to perform even under threats of violence, insisting he was working on his masterpiece, which he would record for his employers' label and perform at their places when it was finished, but not before. After listening, Fixit agreed it was worth waiting for. (Marvel Comics Presents#38/3) - Fixit called Berengetti, telling him -- despite Mickey's protests -- to hire Wayne Newton for Suzy, and to let Newman finish his masterpiece, which he would perform for him first, when it was ready. (Marvel Comics Presents#52/4 (fb) - BTS) - Mickey took an investment research trip to a Nevada military base. (Marvel Comics Presents#52/4) - Mickey was with Dr. West when Dr. M. A. Forrest, an astronomer at the same base, contacted him to inform him of an asteroid "twice the size of Earth" and "headed on a direct collision course towards us." West discussed his fortified rocket springs, but when he noted there wasn't a man on Earth with the leg muscles to reach the asteroid even with their amplication, Mickey begged to differ. (Marvel Comics Presents#52/4 (fb) - BTS) - Mickey told West of Joe Fixit, and then summoned Fixit to the base. (Marvel Comics Presents#52/4) - After Fixit arrived, Mickey and West explained the situation. Fixit agreed to help and, but when he tossed aside West's energy weapon as he departed, West feared he wouldn't be able to destroy the asteroid; Mickey assured West Fixit would manage. (Marvel Comics Presents#52/4 - BTS) - Fixit destroyed the asteroid and confronted the Ralfzz children who had sent it there as part of game, explaining how they had nearly unwittingly destroyed an inhabited planet. (Marvel Comics Presents#52/4) - When the Ralfzz children returned Fixit to Earth in their starship, West asked Berengetti what the craft was, but Berengetti feared Fixit would actually tell him. (Incredible Hulk II#357) - Glorian (who was on a somewhat convoluted plot to ennoble the Hulk) appeared to Berengetti as he was going over ledgers in his office. Glorian made Berengetti experience a vision in which Mr. Fixit stormed into Berengetti's office in a rage. The vision dissipated after a moment, but Berengetti was shaken as it occurred to him what Fixit could potentially be capable of. (Incredible Hulk II#358-359) - Mr. Fixit's battle with the undead Maggia hit man called the Ghoul spilled across Las Vegas and eventually ended up in the Coliseum, with Mr. Fixit defeating the Ghoul by pinning him on a meat hook in one of the Coliseum's freezers. Afterward, Berengetti fired the Fixit, explaining that he had brought too much trouble into their lives. Berengetti also revealed that he knew all along that Mr. Fixit was the Hulk, and that if the Hulk harmed him, he had arranged for the Hulk's true identity to become public. The Hulk left angrily, saying he quit. (Incredible Hulk II#395 (fb) - BTS) - Berengetti and Suzy got married. (Incredible Hulk II#395 (fb) - BTS) - Sam Striker, a gangster intent on establishing operations in Las Vegas, had his henchman Frost shoot and kill Berengetti. (Incredible Hulk II#395) – Suzy attended Michael Berengetti’s funeral. Comments: Created by Peter David, Jeff Purves, and Mike Gustovich. The Hulk's Mr. Fixit days are classic. Do yourself a favor and go read them. I wonder if Mickey ever got to hear Brian Newman's masterpiece before he died...or perhaps he later played it for Suzy? It would be a nice follow-up touch, I think. There's no evidence that Mr. Berengetti ever met She-Hulk, but since She-Hulk defeated someone assaulting his casino, I think he'd consider her something of an ally.